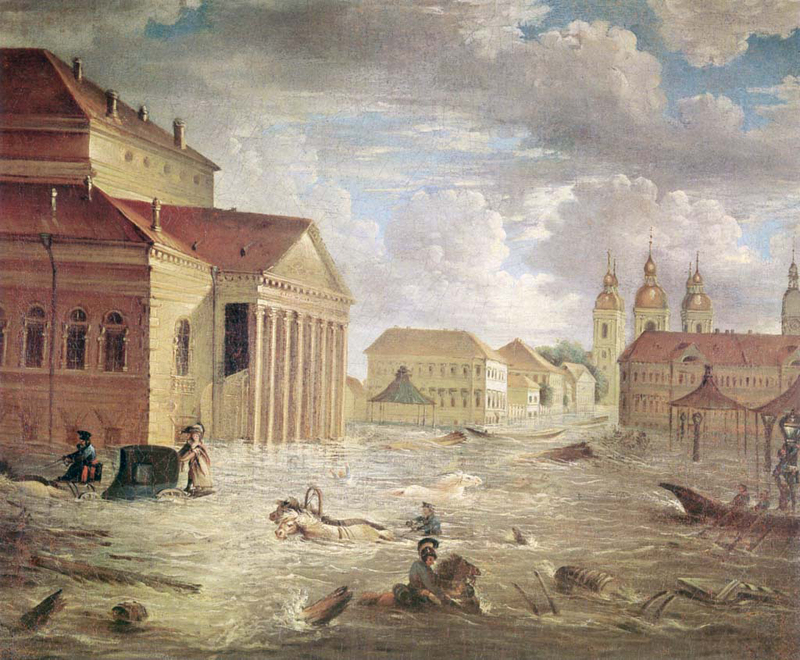 The flood of 7 November 1824 was the greatest flood in the history of St. Petersburg. Short-lived storm-surges are not unusual in St. Petersburg, which is located on the delta of the river Neva, but this one far exceeded the normal levels. On the evening of 6 November 1824, a storm broke out over the Baltic Sea, abating only towards morning. It caused surges to move eastwards up the Gulf of Finland, and at 10 am the flooding began. By 2 pm the Neva was already returning to its course. However, during the course of the flood the Neva’s water level reached a record height of 4.20 m above sea level, making it the most destructive flood the city had ever witnessed. Source: Brockhaus and Efron Encyclopedic Dictionary. St. Petersburg: Brockhaus, 1907. Vasilevsky Island suffered the most damage. Several hundred people died; it was impossible to establish the exact number of casualties. Many animals drowned, and it took several days for their corpses to be cremated. Roads were washed out and river and canal embankments sustained damage. The rising water demolished cesspools, the contents of the gutters flowed onto the streets, and the city’s already poor sanitary conditions became even worse. Fedor Yakovlevich Alekseev’s 1824 painting of St. Petersburg’s Karuselnaya square (now Teatralnaya square) during the 1824 flood. 1824 Painting by Fedor Yakovlevich Alekseev. It took St. Petersburg over a decade to recover from the enormous damages wreaked by the 1824 flood. This delay exacerbated the unsanitary conditions of the city and facilitated the spread of cholera, such as during the first cholera epidemic in 1831. In 1824, a competition was announced for flood protection projects in St. Petersburg. 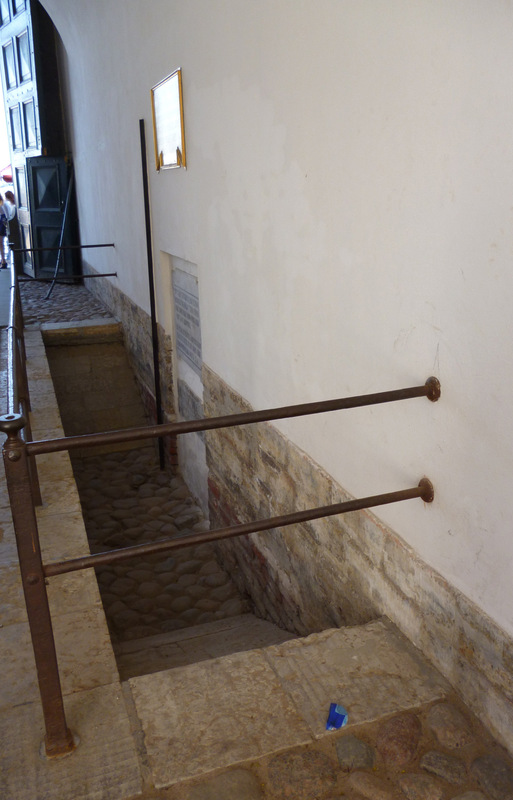 Thus, the flood became a catalyst for the elaboration of new technologies to fight the elements. In 1825, Pierre-Dominique Bazaine, director of the Institute of Transportation Engineers, proposed constructing a dam 22 km in length that was to cut across the Gulf of Finland from Lisy Nos through Kronstadt to Oranienbaum. A lock for shipping was to be built in the Morskoi canal district, as well as a weir at the southern end of the dam. The project was not realized due to navigational difficulties. But another of Bazaine’s projects came to fruition: the Obvodny canal (constructed 1805–1834), which was intended not only to serve as a shipping passageway, but also to drain the overflow from the Neva in case of flood. However, the project was founded on a mistaken idea of the nature of these floods. Until the turn of the twentieth century, it was believed that the primary cause of flooding was the strong westerly wind, which held up the rapid course of the Neva and made it overflow. Barabanova, Kseniya. 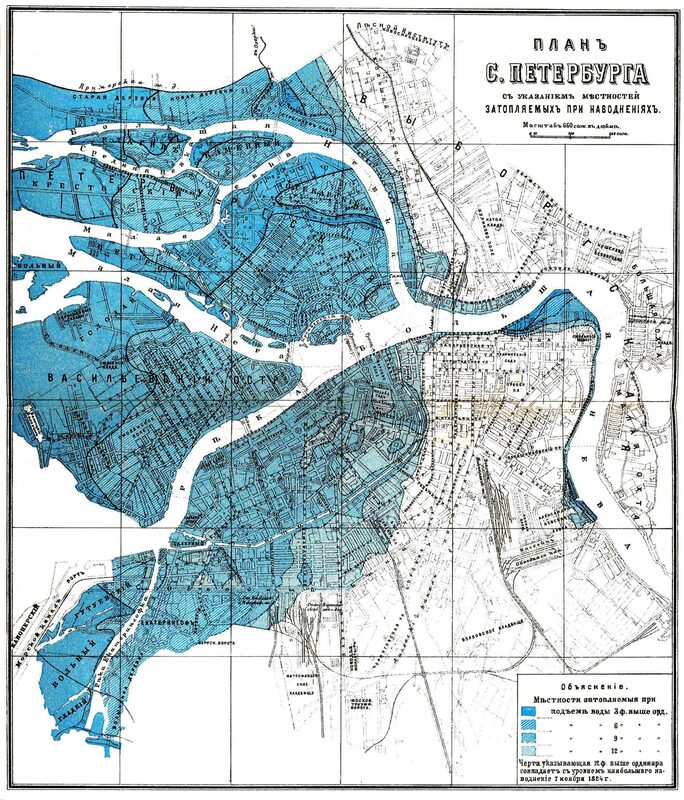 “The St. Petersburg Flood of 1824.” Environment & Society Portal, Arcadia (2014), no. 7. Rachel Carson Center for Environment and Society. https://doi.org/10.5282/rcc/5387. Berkh, Vasilii N. "Podrobnoe istoricheskoe izvestie o vsekh navodneniiakh, byvshikh v Sankt-Peterburge." Zapiski Gos. Admiralteiskogo departamenta (1826). Karatygin, Petr A. Letopis peterburgskikh navodnenii. 1703–1878. St. Petersburg: Tip. A.S. Suvorina, 1889. Pomeranets, Kim S. Neschastia peterburgskikh navodnenii. St. Petersburg: Iskusstvo 2009. Pomeranets, Kim S. Tri veka peterburgskikh navodnenii. St.Petersburg: Iskusstvo, 2005. Pyliaev, Mikhail I. Staryi Peterburg. Reprinted Leningrad: Titul, 1990.